Halifax and Cape Breton, Nova Scotia. 24th of June 2011 and day 41 of our Cross Canada Trip. We left Murphy's Cove and headed for the KOA Campground 35 km outside Halifax in Upper Sackville. Liz' sister Annamarie arrives the 25th in the morning. She flies in from Toronto and will travel with us for a week. After setting up camp on the 24th, we go and stock up on supplies, we found a Costco, Superstore, Canadian tire and more.... managed to spend $652.00 We are not sure how but it did not take long. On the 25th in the morning we picked up Annamarie at the Halifax airport, she is such a sweet person.... We went back to our trailer and got Annamarie unpacked and had some lunch. 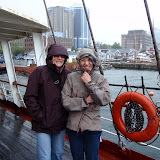 Time to tour Halifax, in the rain and the fog, oh well it could be worse. We visited the Maritime Museum, very well laid out and interesting. I was not my self though, had a bummer of a cold and pumped cold medication like crazy.... must have looked like London Drugs on two legs. I knew it, we should have bought stocks in Advil Cold. Pier 21, where many immigrants to Canada arrived. We went to the farmers market...... so much good food and interesting products for sale. We left downtown passing Pier 21 and came back to camp. As we passed through the security gate to the campground, I was asked if my nick name was "Rudolph". Guess this cold was getting the best of me. We had made arrangements for Silvia and Jörg (who now had traveled on their own) to meet up with us again for supper and celebrate Silvia's birthday. It was so good to see them again. Liz and Silvia.... Happy Birthday Silvia! We put half a cow on the BBQ, some baked potatoes in the oven, steamed asparagus, all while a few bottles of Cabernet Savignon were breathing heavily on the table. We sang (actually more like howling) Happy Birthday for the birthday kid, Silvia!!! She looks great for her age. Later that evening we said good bye to our dear friends Silvia and Jörg. They were flying back to Switzerland the next day, and we were heading for Cape Breton. After a good breakfast, we were ready in the morning of the 26th of June 2011, day 43 our our trip. We pulled out of the campground around 10:30am, destination Cape Breton (with a few small detours). We drove toward the Annapolis Valley on Hwy 101, passed Windsor, the birth place of hockey, onwards to Wolfville and stopped in at Grand-Pré National Historic Site. Grand-Pré National Historic Site is free with your Parks Canada Discovery (Family) Pass. (sisters are included in the family). It is a great lesson in history, a sad part of our history. It is the history of the expulsion of the Acadians in 1755 by the English. The Acadains had carved out a comfortable life in the Grand-Pré area since 1680. They painstakingly built dykes to create good fertile farm land. Then the French lost Nova Scotia to the English. At first all was fine, but by 1750 the British wanted them gone and by 1755 the English ordered them deported. As with all expulsions, terrible suffering occurred. Many of the Acadians went to Louisiana, Quebec etc. Some came back later, but did not get their land back. Sad story it is, like all wars for dominance of creed. We drove on and camped at Whidden's Campground and Cottages in the town of Antigonish. This is a great campground and would stay here again for sure. Antigonish is home to the oldest continues run Highland Games. It is also home to St. Francis Xavier University. A very pretty town. 27th of June, day 44 of our Cross Canada Trip. We packed up and headed east from Antigonish on Trans Canada Highway all the way to St. Anns. From there we took the Cabot Trail #312 to Dingwall. Unfortunately the weather had a temper tantrum and was not co-operating at all. We knew the trail was very beautiful but the fog would not give in. We arrived at Hideaway Campground and Oyster Market in Dingwall, we had booked for two nights. Nice campsite with views from the non serviced sites. They have 3 or 4 serviced sites in a treed area where we stayed. After supper we lit a fire, ate some more garlic, sprayed on some more repellent, but we were unable to keep the mosquitoes at bay. We surrendered to the trailer, well punctured!! As morning broke on the 28th of June, I awoke to the smell of Liz' pancakes and fresh coffee. Wow! Life is good! To top things off there was a blue sky outside. After breakfast, we hopped in the truck and headed for Meat Cove. On the way we stopped at Cabot Landing Provincial Park. The story here goes that Giovanni Caboto, aka John Cabot and his son Sebastian landed here first when they arrived in Nova Scotia. 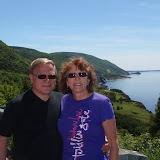 We drove on to Bay St. Lawrance, Capstick and Meat Cove. Wow, this is remote and the last part is over gravel roads and what looks like temporary bridges. We later found out that they had a down pour in August of 2010. It came down in buckets, 250 mm in four hours. Roads, bridges, you name it, it all headed for the ocean. Meat Cove is very pretty with a campsite. But forget about bringing a trailer (maybe a mini one) too many switch backs. It was lunch time, we checked in at the Meat Cove Community Restaurant, located within the community center. Great food, we had seafood chowder and fresh buns.... soooo good! As we started driving back towards camp, we all comment on the lovely weather we had, not a cloud in the sky.... What if tomorrow was foggy? Well, we better drive at least to Cheticamp and take in some of the fantastic scenery of the Cape Breton Coastline along the Cabot Trail. Later back at camp, I was by now really fed up with my cold, so I gracefully passed it on to Liz. She was duly impressed, guess what, I was in the dog house for the next few days. For more pictures of this part of our trip click the images of the two photo albums below. Thank you for this article. I first time see pictures about "Expulsion of the Acadians". These pictures convey the athmosphere of that time. And of course you have nice photos!